Join us for an afternoon early twentieth century masterpieces for solo piano in the intimate and enchanting setting of the Maybeck Studio. 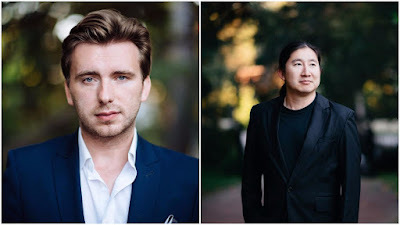 Igor Lipinski and Owen Zhou return to the Bay Area after acclaimed performances at Old First Concerts to present a richly diverse cross-section of musical languages from the first half of the last century, including Scriabin's rarely performed but intoxicating Eight Sonata and excerpts from Szymanowski's poetic Mazurkas op.50. Seating is limited. Get your tickets here. The recently appointed Assistant Professor of Piano at the University of Oklahoma, Dr. Igor Lipinski made his American orchestra debut with the Buffalo Philharmonic Orchestra on NPR’s Performance Today, and performed as a soloist with Rochester Philharmonic Orchestra, Cape Cod Symphony Orchestra, Butler County Symphony Orchestra, Woodstock Mozart Festival Orchestra, Lakes Area Music Festival Orchestra, and Paderewski Symphony Orchestra at Chicago’s Symphony Center. He maintains an active concert career in the U.S. with over 100 performances to date including recitals in California, Oregon, Nevada, Utah, South Dakota, Wisconsin, Illinois, Tennessee, Pennsylvania, New York, and Florida. Owen Zhou made his New York debut with the New York Concerti Sinfonietta in 2012, where he performed the rarely heard Scriabin Piano Concerto as the first prize winner of the New York Concerti Sinfonietta International Concerto Competition. A resident of Denver, Colorado, Owen maintains a full teaching studio. He has also made a name for himself as an audio engineer and cinematographer in the Denver area. The quality of his work has gained him numerous high profile clients such as the Cheyenne Symphony Orchestra and members of the Colorado Symphony. An avid mountaineer and skier in his spare time, Owen is on his way to climb all 58 of Colorado’s famed 14ers, mountain peaks over 14,000 feet in elevation. This journey has become the inspiration for a multi-media performance project with music composed by composer and pianist Paul Sanchez.